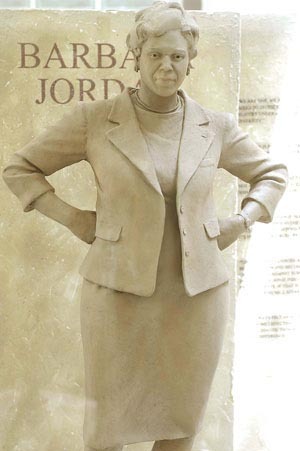 Barbara Jordan’s voice was distinctive, and commanding. “The voice of God,” Molly Ivins called it. After Jordan’s death, Francis X. Cline wrote what might be an even higher tribute, saying her voice was “as though Winston Churchill had been reincarnated as a black woman from Texas.” She spoke in complete paragraphs, usually, with words that seemed selected carefully to fit exactly the ideas she presented. I went up to what I now know was the Cabinet Room. There were other people assembled, people who were active in the civil rights movement. We sat and waited around a table for the President and the Vice President, Hubert Humphrey, to arrive. Well, as I sat there really at the far end of the table, I still said to myself, “Now, Lyndon Johnson probably doesn’t know who I am or what I am about, and my name probably just slipped in somehow and got into that [list].” So the President came in, everybody stood up. He sat down, we all sat down, and we started to discuss this legislation, fair housing legislation. And the conversation was going around the table. The President would call on first one person for a reaction and then another person for a reaction. Then he stopped and he looked at my end of the table, he said, “Barbara, what do you think?” Well, I just . . . in the first place, I’m telling you, I didn’t know the President knew me, and here he’s looking down here saying “Barbara” and then saying, “What do you think?” So that was my first exchange with Lyndon Johnson. I’m startled. I got myself organized, of course, not so that I wouldn’t stammer, since it is not my habit to stammer when talking, and I gave a response and then this conversation ensued. That was my first contact personally with Lyndon Johnson. The glories of oral histories. How can you use this in the classroom? 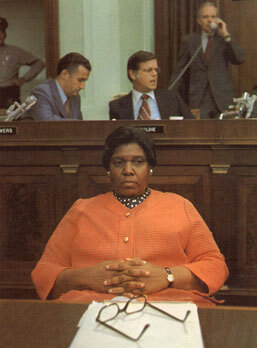 You are currently browsing the archives for the Barbara Jordan category.